Located at the confluence of the Kazanka and Volga Rivers, the city of Kazan is a melting-pot of Russian and Asian cultures, deeply embedded in the city’s history, culture and cuisine. 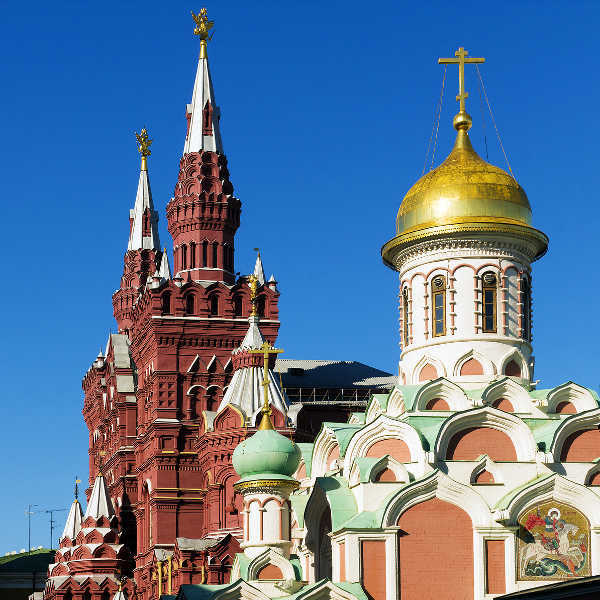 As one of Russia’s largest economic and cultural hubs, the city has a population of 1.2 million citizens. Tourist attractions include the Kremlin and Shalyapin Palace Hotel. 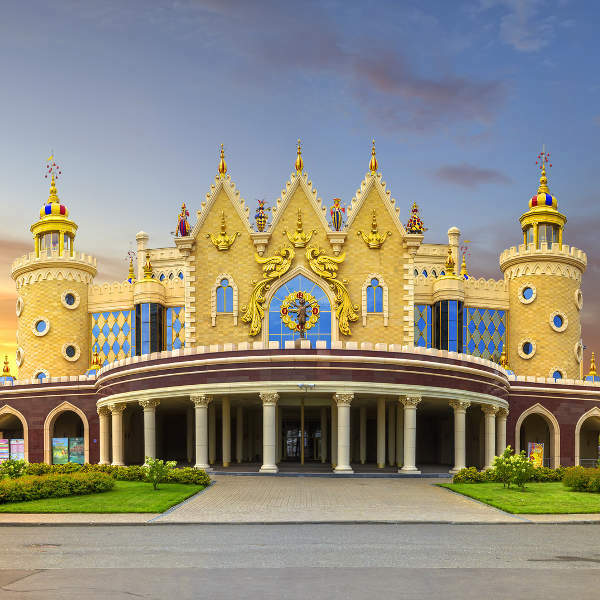 Cheap flights to Kazan are now available for a limited time only, so book your flight today and prepare to be enthralled by the festive atmosphere and cultural landmarks of this historical city! Kazan is home to Kazan International Airport (KZN), which is a 40-minute drive from the city centre. Kazan is filled with interesting structures, dating back to its earliest times. Some key buildings to look out for include the masterpiece Shalyapin Palace Hotel, Kazan City Hall and the Söyembikä Tower. Known as a city where East meets West, Kazan is made up of multiple ethnicities and religions. You’ll find landmarks like the Qol-Şärif Mosque and the Cathedral of Peter and Paul co-existing side-by-side. As one of Russia’s prolific cultural centres, Kazan is home to splendid operas, ballets and contemporary theatre. Home to many famous directors and artists, the theatres exude history and character. Whether you plan to visit during summer or winter, Kazan is appealing all year round. Summertime, between June and August, is a drawcard for many tourists as the snow has melted away to reveal beautiful landscapes and botanical parks. The autumn season, between September and October, is also a lovely time, as crowds have dispersed and the city is bathed in golden autumn hues. If you’re wanting to experience a winter wonderland, the magical white winters between November and February cover the city in a crisp, white blanket of snow, perfect for skiing and snowball fights! 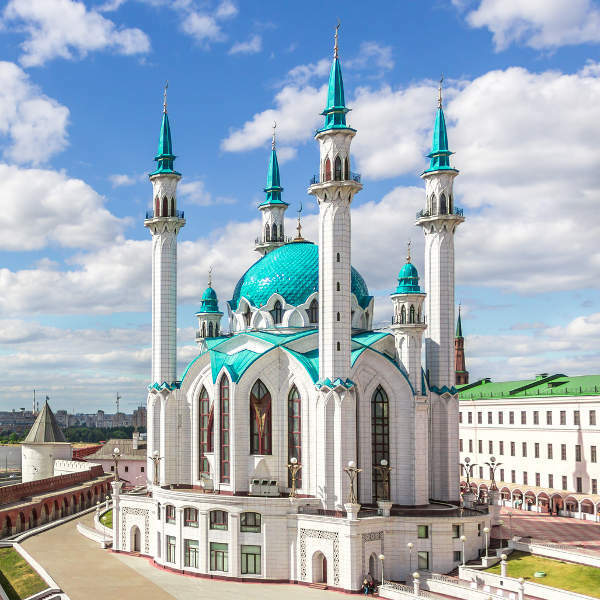 The enchanting city of Kazan is a colourful myriad of Muslim and Russian culture. This large port city is situated at the confluence of the Kazanka and Volga Rivers and is known as where ‘Europe meets Asia’. This independent city is one of Russia’s largest economic, scientific and cultural hubs. Comprised of a mixture of ethnicities, including Tatar and Vietnamese, the city’s attractions and cuisine are a fusion of cultures. The central feature of Kazan is the Kremlin, originally built around the 10th century. It houses many features, including the Annunciation Cathedral, Söyembikä Tower and the Qol-Şärif Mosque. A walk along Bauman Street will afford you the opportunity to see the Temple of All Religions and have a look inside a few museums. Browse the shops, bars, and cafés and you’re bound to walk away with interesting ethnic souvenirs, reflective of Tatar culture. Those with a flair for the arts should take in a ballet at the Opera House or a show at the ornately-designed Ekiyat Tatar Puppet Theatre. Having just recently earned its reputation as a sports city, due to its investment in upcoming international tournaments, the city’s tourism continues to flourish all year round! Compare several airlines and book your cheap flights to Kazan online at Travelstart! Kazan is said to be one of the safest cities in Russia, however, it is not totally crime-free. Be aware of strangers approaching you on trains or in the streets, as they may have intentions to pick-pocket. Do not flash money or valuables around as this immediately makes you a target – keep excess money and cards locked away in your hotel room. Confirm with your hotel which areas should be avoided, especially at night, and circle these areas on your map. Keep your passport on you at all times, preferably in a discreet money belt or travel purse, in order to prevent being harassed or fined by police, should they approach you. Be wary of drinking UNLABELLED vodka. Bootleg vodka is common and you may be unknowingly drinking shoe polish or other chemicals – stick to labelled bottles purchased at a store. Watch out for wayward traffic when walking – pedestrians do not have right of way over cars. You may experience effects of discrimination in Russia. Try to not take it personally or be lured into any kind of altercation – stick within a group where possible. Ensure you are up-to-date with routine vaccines before travelling. It is recommended to be vaccinated against Hepatitis A, as you may come into contact with contaminated food or water. Tap water is unsafe to drink – stick to bottled water for consumption and brushing teeth.